Andreya and Alec are Fun In The Sun Weddings’ newest newlyweds! 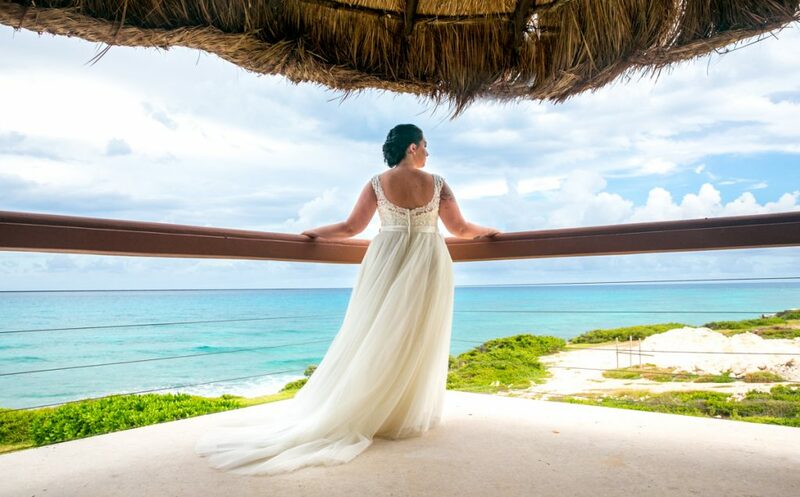 Ordinarily, we capture happily-ever-afters in the Riviera Maya, but when the Mother of the Bride contacted us and said we MUST shoot her daughter’s wedding on the stunning island of Isla Mujeres, Mexico, well…how could we possibly say no? The bride and groom chose a private villa on Isla Mujeres’ rugged Caribbean coast to do their “I Do’s”. Casa Gemelos offered a stunning backdrop and intimate setting for a celebration with their closest family and friends. Take a walk through the property here on YouTube. After getting ready in the villa with the glam squad at Beso Brides, Alec got his First Look at his beautiful bride perched on top a rugged cliff overlooking the Caribbean Sea. After the ceremony, we all hopped into golf carts and headed south to Punta Sur. Isla Mujeres’ southern tip is like a postcard and was a dream for our photo and video team. Majestic cliffs with crashing waves, a sculpture garden, and the remains of a Mayan Temple were some of the goodies this location gave us before returning to Casa Gemelos for the wedding reception. Ahhhh, take us back to Isla Mujeres! What a perfect location for a destination wedding in Mexico. Andreya & Alec, thank you for choosing us to capture this amazing day. We wish you every happiness in this next chapter together with your little boy. Congratulations! Are you getting married on Isla Mujeres and want the best Isla Mujeres wedding photographer for your beach wedding? Then contact us now! We are Fun In The Sun Weddings, for the best Riviera Maya wedding photography. Check out Andreya & Alec’s super gorgeous highlight video from Frame Wedding Film, our talented partners in crime! Want to know more about Casa Gemelos? Read unbiased reviews on Tripadvisor here. These are beyond what I imagined!